Click "Add to cart" and provide your zip code. Select your desired shipping options to and from our faciltiy. Provide your contact information, problem description and payment for return shipping. 365laptoprepair.com will provide you with basic diagnostic based on your problem description as we have experience with 99% of laptop failures. We will narrow down the problem to the possible defective parts and give you a projected cost to repair your laptop. This service is free if we perform the repair, however there is a $49 diagnostic fee should you choose to not have your computer repaired by us. We've perfected our repair process from receiving and repair all the way through final testing in order to ensure the best possible customer experience. We guarantee you the lowest price, downtime, and stress. We know how important your laptop is to you. Our overnight service will get you back to work within 24 hours! We'll repair your laptop to full working condition at a fraction the cost of having to buy a replacement. You can send us your laptop and one of our experienced technicians will repair it for you! We have the parts in stock and our turn around for any repairs on these models is 1-2 business days as we have anything necessary to complete a prompt and efficient diagnostic. Are you ready to start you repair and get your laptop fixed fast? Click the “Add to cart” button below to begin the checkout process. We accept credit cards through Authorize.net and PayPal. We offer many shipping options to and from our warehouse. You can pack your laptop and ship it to us yourself, or we can send you a pre-paid shipping label and a safe ship box to ship your laptop quickly, easily and safely! Check out our videos that explain the checkout process! Our Authorize.net checkout video. Our PayPal checkout video. Feel free to contact us with any specific questions regarding this or any of our repairs through our Contact Us form. Next day shipping available from $49. Are you not sure what is wrong with your Laptop? You can send it to us and we will run a full diagnostic. If we end up performing a repair on your laptop, this service will be free of charge. If you choose not to have a repair done there will be a $49 diagnostic fee. If you know the repair you need and don’t see it listed here or you want to contact us about specifics, you can use our Repair Estimate Page to receive a free quote. The replacement service that we provide for the Lenovo Yoga IdeaPad includes the cost of a brand new LCD screen and the labor to install it. This service also comes with a No Dead Pixel Guarantee and a 6-month warranty on parts and service. We use genuine new LCDs, not aftermarket or cloned products. Please contact us for a price on this repair. This repair will not include the outer casings of the laptop, the screen bezel or the screen hinges. If you need one of these things replaced, it will be an additional cost. Request a Custom Quote for more information. Feel free to contact us with any specific questions regarding any of our repairs through our Contact Us form. If your current hard drive is making clicking noises or otherwise acting abnormally slow then replacing the hard disk will rejuvenate your computer and ensure operation for years to come. You could also upgrade your hard drive to a larger size or a faster speed to get more storage for music, movies, games and all the other stuff you love. The ASUS 302LA comes with a 500GB 5400RPM hard drive. You can upgrade to a Solid State Drive for lightning fast boot up times. Hard drive pricing includes installation and configuration of the new drive only. A 3-year warranty is included with all hard drives. If you need your data transferred from your old hard drive, or a new operating system installed, please add the necessary items from the Software Upgrade and Repair section below. We will return your old hard drive to you. If your hard drive is non-functional data recovery options are available, Contact Us for more information. Solid-state drives bring quicker boot times and ultra-fast performance. It is common for solid-state computers to boot completely in under ten seconds. Switching from traditional to SSD storage is by far the best way to increase the performance of your computer. If your computer slows to a crawl when you have too many programs open then increasing the amount of memory in your computer will considerably improve system performance. 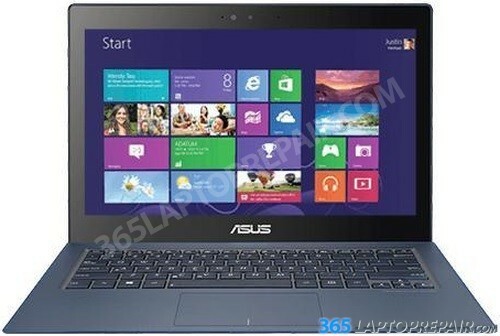 The ASUS UX302LA comes stock with 4gb. It cannot be upgraded any further because it is integrated into the board and cannot be removed. If your computer doesn't have a working DC jack then you wont be able to charge it. DC jack repairs are some of the most common repairs we do, so we will have your computer up and running in no time! There are a variety of symptoms that indicate you may need your logic board repaired such as: Video problems, power-on issues, unexplained beeping, boot failure. This is the recommended repair for liquid spills. If your keyboard isn't working well or is missing keys, this repair will get it up and running again. Are you having your hard drive upgraded or replaced? Are you having problems with your operating system (Windows) malfunctioning? Do does your computer have a virus you need to get rid of? Do you have a damaged hard drive you want to try and recover? This is the section for all of these problems. Hard Drive Migration: Transfer all your data from one hard drive to another. This is usually done when your have your damaged hard drive replaced or have upgraded to a larger hard drive. Operating System Installation: Have a fresh Windows operating system installed onto your hard drive. We also install anti-virus, anti-malware and other helpful programs to ensure that your computer will run smoothly. This will also take care of viruses that you may have. If you want to save any of the data from your old windows installation, our backup service starts at 59.99. Virus Cleanup: Get rid of viruses that may be slowing down your computers performance or harming the security of your computer.